Just 1,500 nautical mile from Great Barrier reefs, lays the Kingdom of Raja Ampat (Four Kings) located in West Papua. 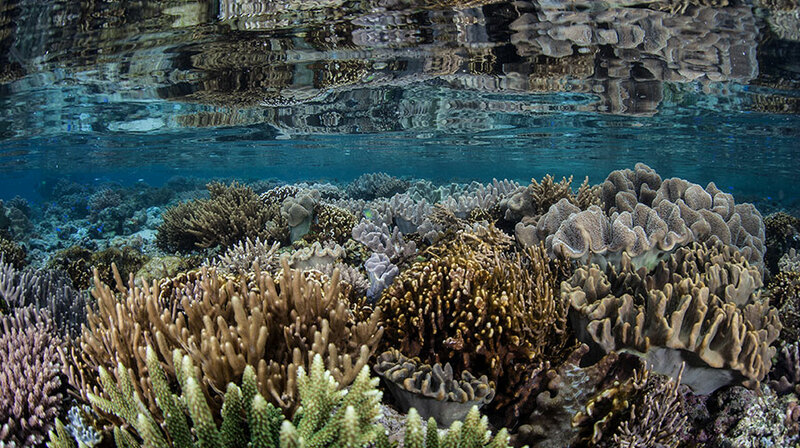 It has long been the marine scientists' and avid divers' best-kept secret of the healthiest coral reefs to explore in a time when most of world famous reefs are dyingdue to ocean acidification. Although most of divers focus on underwater exploration, there is also a great deal to explore on the surface. 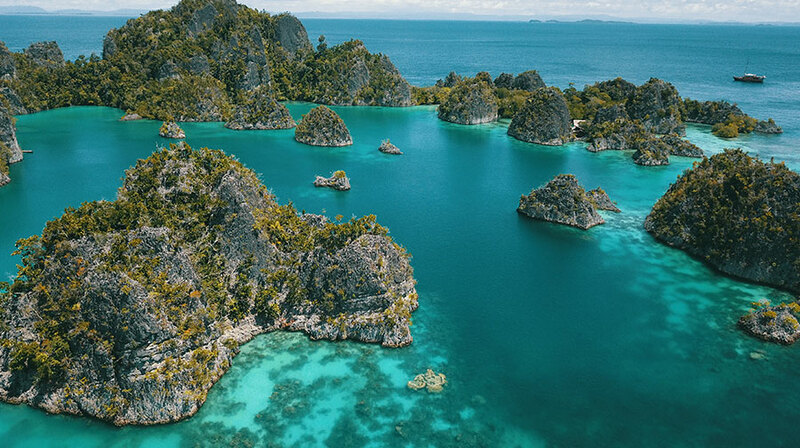 Raja Ampat was recently awarded the #1 snorkeling place on earth by CNN Travel. Its remote location means you will most likely have the place to yourself. One limiting factor in being able to experience this seascape wonderland is travel logistics. It is remote and vast with an undeveloped infrastructure. Therefore, the ultimate mode of transportation is sailing on a luxury yacht. Rather than staying one remote resort, which will limit your experience to a small area, your horizon can change each day you wake up as you travel between these pristine islands. 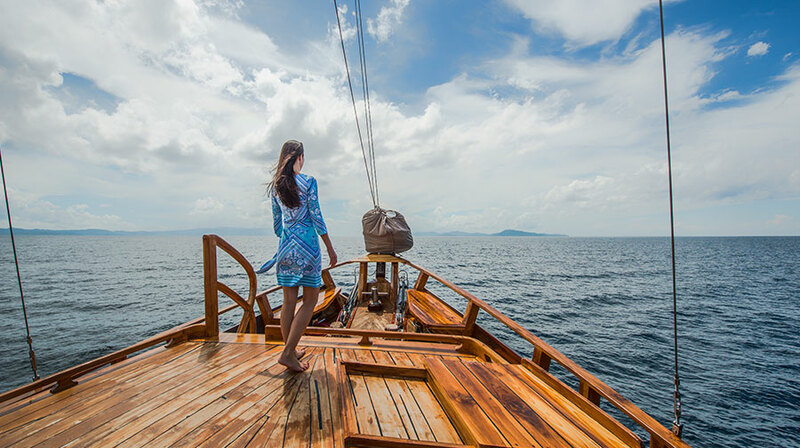 February 2018, Vivienne Tang, a wellness travel guru was onboard of Sequoia sailing Central Raja Ampat. Vivienne Tang is the founder of wellness and travel online publication Destination Deluxe Vivienne has made a name for herself in the wellness and travel field, having worked for various reputable luxury magazines. She has spent 18 years in lifestyle publishing and was previously Editor of #legend, Editor-in-Chief of AsiaSpa, and held positions at Prestige Hong Kong and South China Morning Post. She has also been a judge for the Mr and Mrs Smith Awards. Destination Deluxe is a travel and wellness publication that handpicks the finest luxury resorts and hotels, the most sought-after destinations, retreats and spas from around the world. Her air travel from Hongkong was smooth and easy with one stopover at Jakarta Airport by Garuda Indonesia before departing to Sorong, a gate harbour town to Raja Ampat. 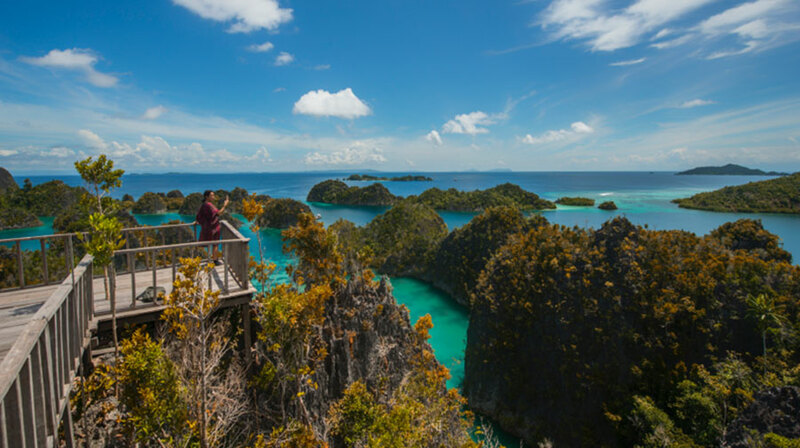 Air travel to Raja Ampat has never been easier than before. Starting this year, Garuda Indonesian has opened a new direct flight from Jakarta (CGK) to Sorong (SOQ) in West Papua on a 4 hour and 15 minute flight in Boeing 737-800 series. From Bali, you would need to transit in Makassar and stay overnight in the Ibis airport hotel. Once she arrived in the airport, our crew member picked her up at the airport, which only took 15 minutes to get to Sequoia to start her incredible safari. Sorong is West Papua’s largest city, while Jayapura is the largest city in the East. 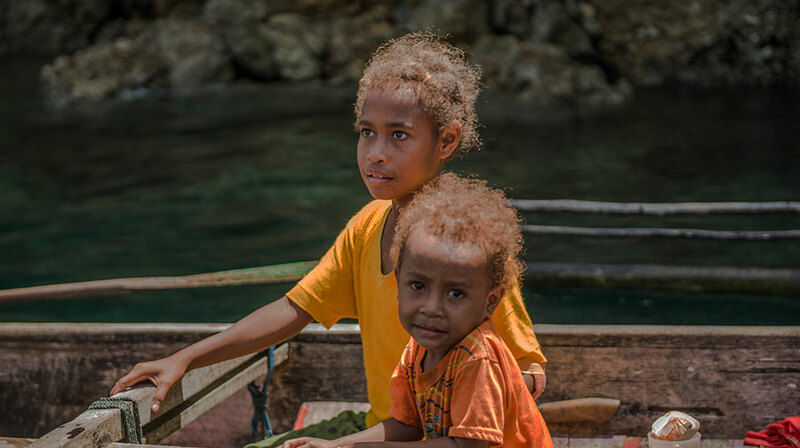 The “Sorong” name originates from “Soren” in the Biak language. Soren means “deep and wavy ocean.” After centuries of contact with Chinese merchants, European missionaries, Moluccans and Celebes traders, the name underwent further change into Sorong. We were under engine and sail power for 8 hours to reach central raja Ampat. 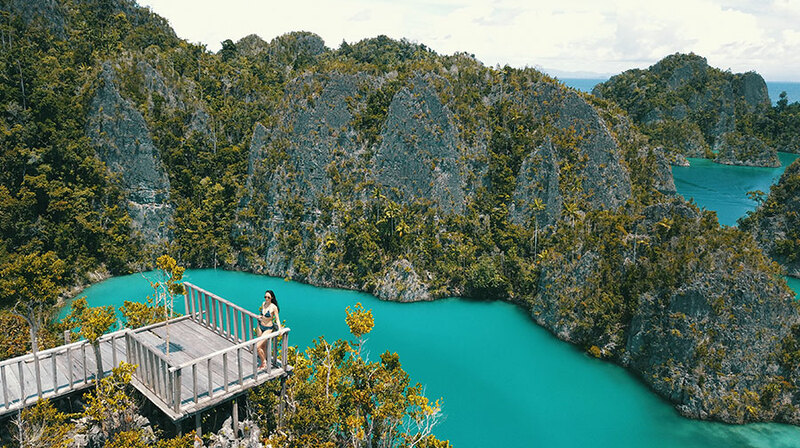 The islands within Raja Ampat islands are considered by many to be the most beautiful islands on earth. There are hundred of peaks from to Wayag in the North to Dapunlol in the South that you can hike to get a bird’s eye view and take pictures. It also offers various types of natural attractions like karsts, flora and fauna. Reaching the top of the mountain takes some effort but once on the summit, the refreshing air and stunning views will amaze you. We even saw an eagle cruising high above us. After we walked down back to lagoon, we swam and snorkeled in one of its blue lagoons to cool down while our crew prepared a fresh fruit plate or cold press juice. Our first destination was Paynemo, located in Fam archipelago. Paynemo is the Icon of Central Raja Ampat. Towering karsts seem like rising from the bottom of the ocean. Fringed palms trees are covering the karst, in contrast with the turquoise lagoons and deep blue waters are in stark colours. It is the feeling of freedom and in the middle of nowhere is priceless, serene as Vivienne described. During our arrival by Boston Whaler speedboat, we took a 15-minute hike up at Paynemo Peak. The reward for the strenuous climb is a breathtaking 360-degree view of an island-studded sea. With more than 3 main lagoons, we explored these calm waters by Kayak, Stand Up Paddle Boarding, as well as one of our speedboats. As we paddled, we heard the gentle sounds of nature from bird singing to dancing fish. In the far distant as we stayed in the peak, we saw a group of giant bump head parrot fish making the manta shaped lagoon its home, while giant turtle swam back and forth to the surface in the near lagoon. 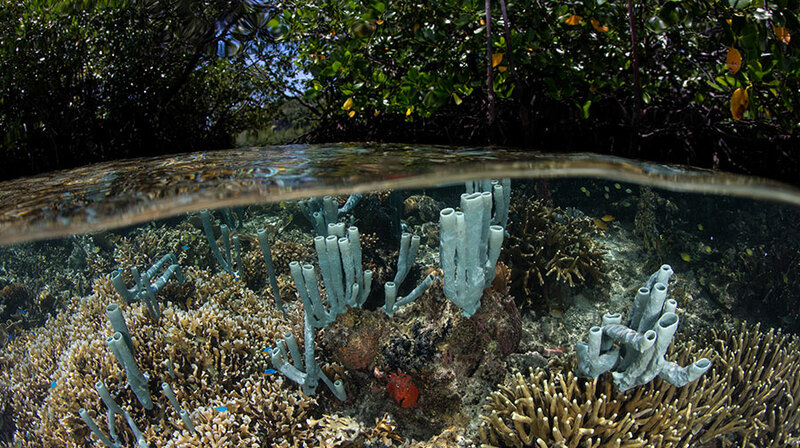 Indonesia has by far the world’s largest population of mangrove trees including the only “blue water” mangroves. Unlike the majority of mangroves elsewhere in the world, the mudflats are not built up, so the water is crystal clear, free of silt and river-borne sediments. This permits lots of light to penetrate to the bottom to the hard and soft multi-colored coral. It is great to snorkel or dive. The Blue Water Mangroves in Southern Misool and Gam are the ideal location for this exploration. In the low ties, you may see Walking Sharks sleeping amid the nearby mangroves during the day. The sand is a home of the myriad of creatures such as Nudibranch, giant Sea Cucumbers, and patrolling Archer Fish. As a bonus, the jungles behind Mangrove are full of birdlife. There is no better way to wake up than to have a cup of morning coffee surrounded by the beauty of Kabuy in Gam Island. We did multiple activities in several locations: Hidden Bay, The Passage, and Pencil Stone. We spent our day just swimming, observing bird, and kayaking as well as visiting local villages. Vivienne learnt how to do a stand up paddle boarding for the first time and loved it. It allowed her to explore a chain of small islands. Imagine paddling here, you will to hear the gentle sounds of nature from bird singing to dancing fish. You can also observe birds and wild plants such as pitcher plants and orchids. If you chose to swim in the lagoon, you may find thousands of purple or light orange stingless jellyfish dancing below the water. It is a paradise not found anywhere else on earth. Sunset cruise was all ours leaving Kabuy Bay to Yanggepo for a scuba diving and snorkeling the next day. Upon our arrival on a calm sea of Yanggepo island, Sequoia crew set up a cinema on our sky deck for us to enjoy the stars against the blue sky of Raja Ampat. Yanggepo Island offers a seemingly infinite horizon between sea and sky. The island is referred to as “Mirror of the Ocean” because of the clarity of the water and beaches. It has golden sand beaches surrounded by crystal clear water, mangrove vegetation, forests and wildlife. We spend a half-day exploring Mayhem dive site for divers, while snorkelers explored the top. You can expect to see garden eels, candy cane-striped sea cucumbers and burrow-dwelling mantis shrimp as well as massive school of barracuda, fusiliers, unicorn surgeonfish, mandarin fish and feeding lionfish. After lunchtime, we sail for 2 hours to Airborek Island for scuba diving and snorkeling on jetty. Raja Ampat scuba diving has gained a reputation as being amongst the finest in the world, which Vivienne really enjoyed on her safari. She was the center of thousands of fish just inches from your mask as they dart and change direction in a split second. The rainbow of colors, textures, and fish shapes bring you into a world that seems as if Pixar Animation created it. Imagine swimming along side of manta rays, sharks, stingless jellyfish, giant bump head fish, colorful soft coral and thousands of reef fish while staying on the surface of the water. 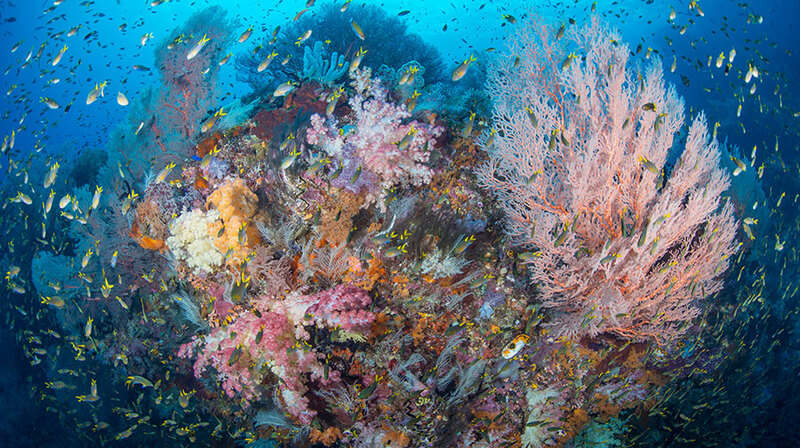 The aquatic treasures of Raja Ampat can be experienced at any level. All you need is a mask, snorkel, and fancy swimsuit. In 1860, Wallace sailed to Waigeo from Halmahera to collect birds of paradise. His transit through the passage between Gam and Waigeo inspired him to state a quote “the only region where all together new and unimagined forms of life may perhaps be found.” A perfect day in Sawanderek Village begins with a sumptuous breakfast; homemade pancake and tropical fruits such as dragon fruit, star fruit and jackfruit. We dove and snorkeled under the jetty, which we continued to a beautiful Sawanderek Jetty for a fine snorkeling and scuba diving. As you immerse yourself, schools of fish will welcome you to their beautiful world. You will most likely be surrounded by school of fish from Yellow Fin Fusilier, Batfish, Damsel Fish, Glass Fish to Big Eye Trevally, The Great Barracuda, Bump Head Parrotfish and Colorful Juvenile Sweetlips. As we sail, a school of Dolphins may be swimming along the yacht bowline steering them to their destination. Under the water is not the only place you will be able to explore. There are endless possibilities for exploration on hidden beaches and pristine sandbanks. Once we chose to explore the beach, our crew took us there with the smaller boat and you can bask in the shade while reading a book and observing coconut crabs. 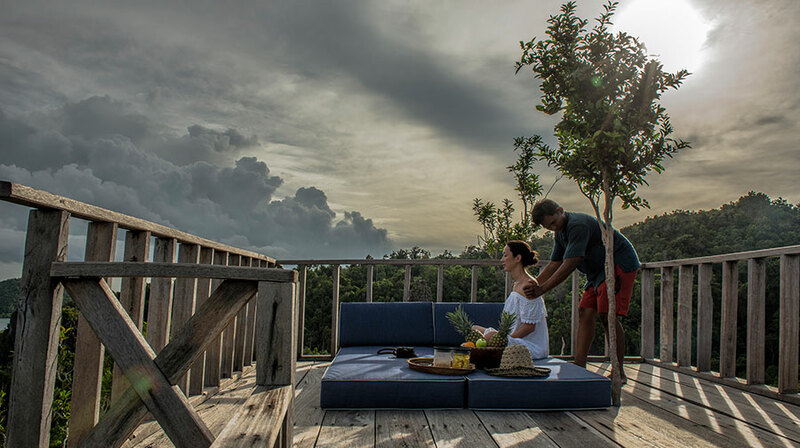 The best are pockets of privacy, artfully selected and in just the right location, not too far to skip to that secret beach where our guests can do a lunch picnic, massage, or climbing coconut tree. Baby sharks are common to be seen on the shallow water near the beach, as well as baby turtles making their first walks to the sea in the late afternoon or in the nighttime. It is majestic. 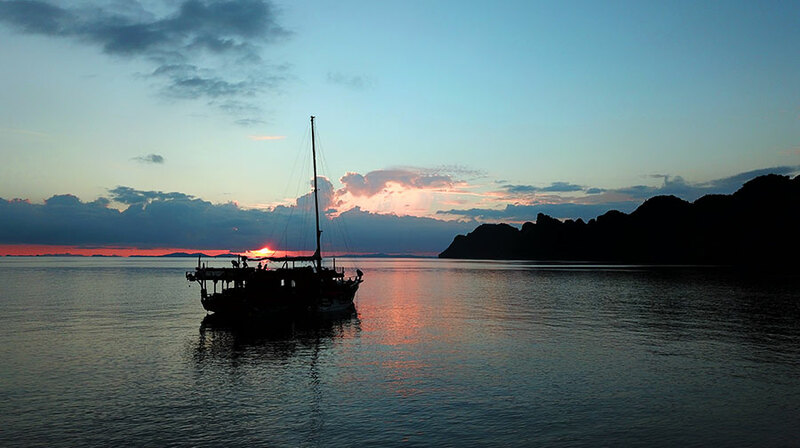 Tonight was our last night on Raja Ampat. We started our day with a sumptuous breakfast made to order and a light healthy lunch. Before sunset we provide with tea and/or your choice of cocktails. Diner will be a multi-course dining experience that you will remember for years to come. 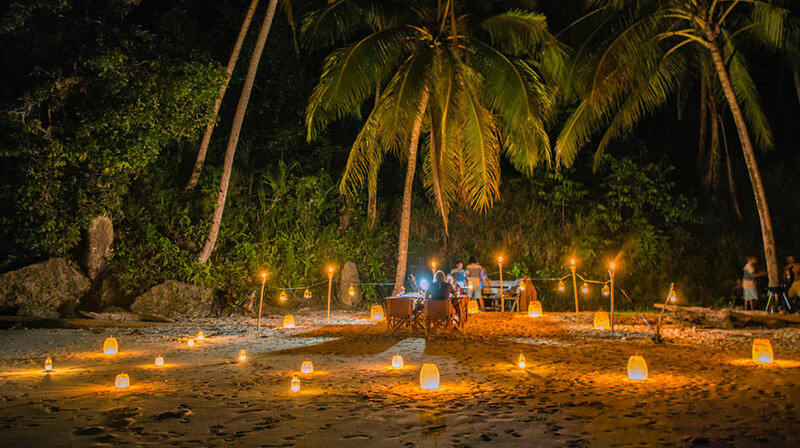 In terms of venue, we chose to spend a beautiful island beach settings hearing the gentle waves and gazing on the Milky Way. It was just beautiful. Wake up in the busiest port in West Papua, Sorong where we will serve you a mouth-watering breakfast. Our crew drove her to the airport and waved a fond farewell as you board your aircraft for your transfer back to Jakarta, and back home to Hongkong. 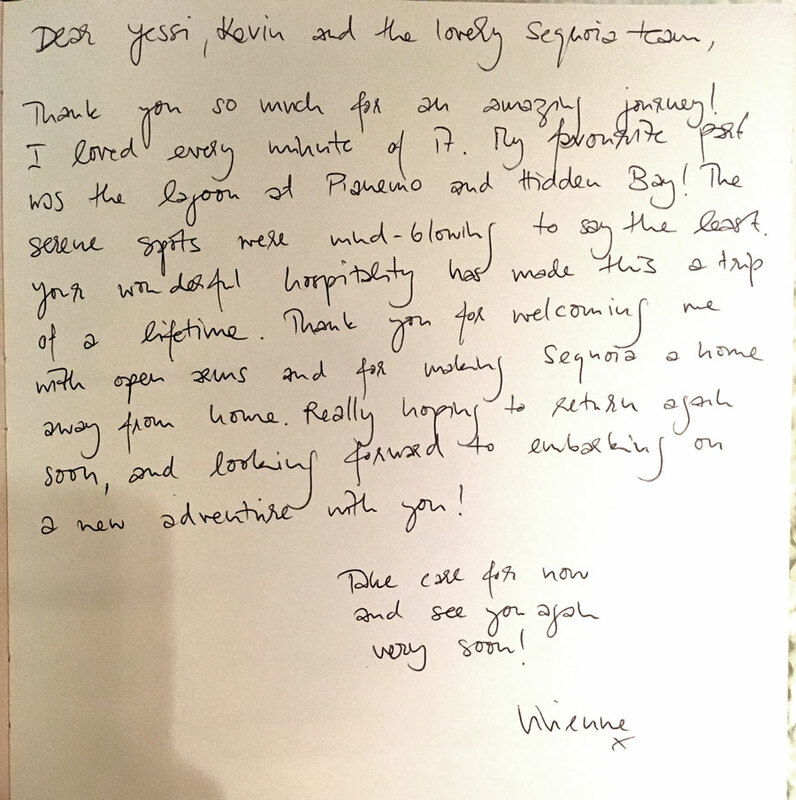 We hope that her safari was all that she dreamed and that we will see her once again for another Coral Triangle Safari!